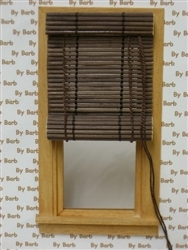 Bamboo Roll up Shade for single window in Brown. Pull the cord and the shade will roll up. Measures approx. 2-3/8 x 4-1/2 inches.